This Friday, Michigan mavericks Founders Brewing will be rolling thru to the Heart, bringing four of their freshest delights for your tasting pleasure. Globally renowned for their IPA's, Founders have upped the bar for accessible yet innovative craft beers - and what goes better with beer than MONSTROUS RIFFS? 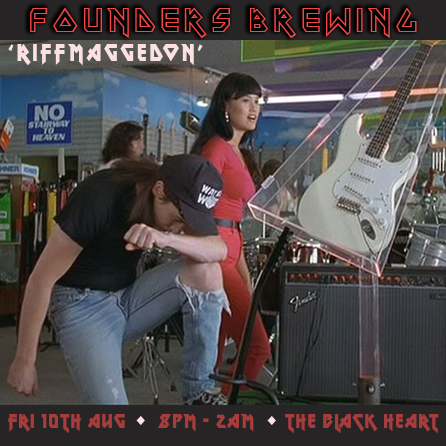 DJ Timbo, part of the Founders crew, will be taking y'all through a musical journey of the greatest riffs from across the decades. History isn't a lesson you need remember, unless it's a history of head banging. Beers will be on all day, and the tunes will be loud from 8pm till closing! Brewed with 100% Cashmere hops, this wheat ale has just the right amount of hop bitterness countered with slight berry sweetness. A substantial malt bill gives a smooth, satisfying flavor – like a fuzzy sweater for your palate.